A love of aviation is often passed down through families from one generation to the next. Such was not the case for me. In fact, my passion for things with wings has usually been viewed by my family with an air of exasperated patience. 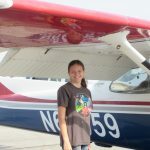 “Don’t mind her – she likes airplanes.” This has not stopped me, however, from trying to encourage my kids to become interested in aviation, and a Young Eagles flight was a key. If you read my previous story, then you know that after dragging my daughter, Cici, to numerous aviation events, it finally dawned on me to just ask if she’d like to go for a flight. To my delight her answer was a resounding yes. We had to wait until June when a local EAA chapter scheduled a Young Eagles flight near us. It was with a fair bit of excitement (OK, mostly on my part) that we headed to a nearby GA airport one sunny Saturday morning. Having never attended a Young Eagles event before, I wasn’t sure what to expect. I was quite surprised and pleased to see the large number of families already waiting when we arrived. 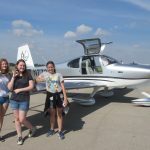 And so I found myself driving to a second Young Eagles event at Jim Moore Field (KDLZ) in as many weeks, with an equal amount of excitement and three additional passengers. The girls were allowed to fly together, this time in an RV10. When the plane landed there was a lot of giggling, excitement and chatter. Liz demanded flying lessons immediately. Much to my surprise, my daughter announced she wants them too. Hooray! So what did I learn in my quest to introduce aviation to the next generation? Well, sometimes teens are more interested than they let on. Also, don’t under-estimate their ability to inspire and influence each other. Would You Like To Fly? This entry was posted on Wednesday, August 23rd, 2017 at 1:22 pm	and is filed under Aviation Education, Flight Training, The Buzz. You can follow any responses to this entry through the RSS 2.0 feed. Both comments and pings are currently closed. Great article, thanks for telling me about it shortly after it happened. You may have created a “Monster” or a bunch of them, HA! Now who gets to pay for the lessons?